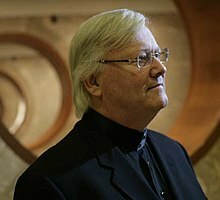 Adrian D. Smith (born August 19, 1944) is an American architect. He has designed skyscrapers including the Burj Khalifa, the Jin Mao Tower, the AT&T Corporate Center, and the Trump International Hotel and Tower, Chicago. He is now building the worlds tallest building that is planned to be taller than the Burj Khalifa, the Jeddah Tower. Smith was born on August 19, 1944 in Chicago, Illinois. He was raised in Chicago, Illinois. Smith studied at the University of Illinois at Chicago and at the Texas A&M University. ↑ "Adrian Smith biography at smithgill.com". This page was last changed on 14 April 2019, at 07:49.